Considering that Apolo Anton Ohno remains a big star of Winter Olympic games, it was no wonder that NBC hyped their airing of short track speedskating action during the Vancouver 2010 Olympics. The first short track event was the 1500m, and Apolo did not disappoint, winning the silver medal. In a surprise ending, teammate J.R. Celski (at right), Apolo's heir apparent, captured the bronze. Before his heat, NBC showed Apolo waiting for his turn to race. He had a chin hair wedge, which frankly in its current incarnation is not attractive. It was pointed out that Apolo is 20lb leaner that he was in 2002. You can really see it. He's all efficient muscle. You could also see in HD close-up that that camera needs to keep from getting that close. Some people are more attractive without a crystal clear view of their pores and skin texture. Surprisingly, Cameraman did a upward jutting crotch shot. You very rarely see that with athletes that have revealing, form-fitting suits. It boded well for the Olympic coverage of the male athletes. Needless to say, Apolo blew away the competition in his heat. In another heat, it was J.R.'s turn. Cameraman didn't show J.R. under his helmet. J.R. is a cute kid from Federal Way, Washington - same as Apolo. Happily, NBC didn't show any visuals of J.R.'s horrible injury from 5 months before at the Olympic Trials, where he cut his thigh with his own blade down to the bone. It was surprising that they didn't show it considering that they showed the Georgian luger being killed. Maybe they were trying to do better. Before the semi-final, Chris Collinsworth did a piece on Apolo. It showed Apolo Anton Ohno shirtless, doing his training. Yeah, he's fit. Even Collinsworth, talking about Apolo working out a lot, said "He's hot right now." At the track, Cameraman did a close-up of Apolo that was ostensibly to show his gloves, but it also gave another extreme close-up of Apolo's crotch. Cameraman is okay. Finally J.R. was shown clearly, although actually it was in a Procter & Gamble commercial. NBC then went back to their graphic ways as they showed J.R. from the previous September, sitting on bloodied ice as the blood pumped out of his leg. Should NBC's coverage get a V rating? J.R.'s semifinal was a good race and you could tell that he was looking good for the final. He took the lead and would not relinquish it. For the final, there was some concern expressed by the commentators about there being three Koreans in it. They are very nationalistic and would be likely to do team play, which is against the rules but difficult to prove. The fear was that if the three gained the first three spots during the race, they could position themselves to prevent anyone from passing. Sure enough, towards the end of the race, the three Koreans managed to team up and take the first three positions. Fortunately, they outsmarted themselves, and on a curve, two of them crashed into one another and took themselves out. They left Apolo and J.R. to fairly end the race as 2nd and 3rd. For Apolo, it was his sixth Olympic medal, and that tied him with Bonnie Blair as the American Winter Olympian with the most medals. For J.R., it was an amazing accomplishment for someone who had a skate blade embedded two inches deep into his leg muscle only five months before. By the way, I really like the light blue and dark blue combination of the U.S. suits. It looks like the really cool palette used by Team USA in the 2002 games. In keeping with the low-key spirit of the country, the Vancouver Organizing Committee put on a rather average Olympic Winter Games Opening Ceremony, with mild entertainment and a minimum of flash. The only unpleasant aspect during the show was the peculiar contradiction of Canadians, which is that since they are so nice and modest they feel compelled to slap you obnoxiously in the face with it. That, and the public displays of self-help affirmations about a national identity, which sadly, almost always come back to, "We're not Americans." Last there was the uncomfortable climax of the torch lighting, which proved you should always have a backup plan and you should never play with fire, especially indoors. The ceremony started with a displayed countdown flashed around the stadium. Love a good countdown. Unfortunately, it was immediately followed by a video presentation of aerial shots of the Canadian landscape. It was pretty, but the show is supposed be about what is happening in the stadium, not about the view from a plane from some time in the past. The purpose was to show a snowboarder coming down a mountain while the list of previous Olympic cities were read aloud, leading to a live snowboarder (Johnny Lyall) riding down onto the stadium floor. It was pretty lame for an opening, and certainly not as good as Salt Lake City. The RCMP brought in the Canadian flag, but they should have gone with 9 Dudley Do-Right types instead of the variety of people, a concession to diversity. Actually, any one type would have been good. It was the different builds and heights that were not aesthetically pleasing. The national anthem was torn up by Nikki Yanovsky. Do Canadians get as upset as Americans when the anthem is not sung as written? Nikki could have done a great job with a classic rendition. Representatives of native tribes gave a welcome to the world. The Indian boys looked like they had stepped out of an A+F catalog (above), which is fine. They did the welcome at the foot of four bizarre zombie totems, which looked ready to eat the brains of the audience at BC Place. Not very welcoming. The athletes were brought in, before the entertainment, which is nice so they can see it. It's fun to do people watching, seeing the different nationalities march in. 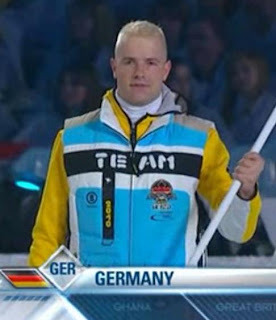 Some really stand out, like the Germans, who seemed particularly Aryan this year. Along side them, keeping order, were a line of Canadian volunteers doing a generic white person folk dance, dressed in what appeared to be long johns. The backsides were not shown to see if they had drop seats. Love drop seats. All the athletes were dressed in winter clothing, but considering that the outside temperature was 48 degrees and they were inside an enclosed stadium, one wonders if the a/c was turned up full blast to set the mood and keep the athletes from having heat exhaustion. 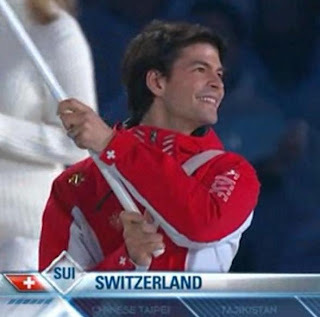 The Swiss flag bearer was Stephane Lambiel, giving a glimpse of how fabulously flamboyant the figure skating is going to be. It must be said, the kid looks like can do more tricks on and off the ice than a Swiss Army knife. 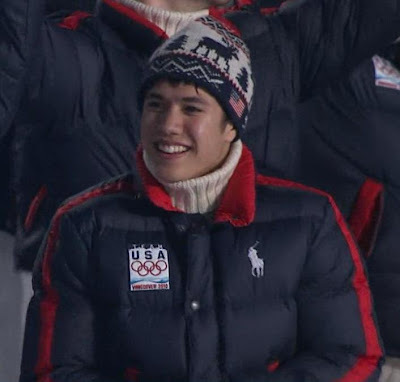 The American team wore Ralph Lauren outfits, with that company's emblem. The huge polo pony emblem looks so tacky, even on regular Ralph Lauren clothes, but especially on a national team's uniform. It's an embarrassment. There were some close-ups of a few of the notable American athletes. In particular, there was the cute face of short track speedskater J.R. Celski, with his teammate Travis Jayner behind him. Also, sighted was the attractive long track speedskater Trevor Marsicano. Eventually all the teams entered and Bryan Adams and Nelly Furtado did a little ditty to welcome them. Mercifully, there was no close-up of Adams. He wasn't so good to see 20 years ago, don't need to see him now in HD. The song finished. The native peoples who had danced frantically and continuously throughout the long athlete entrance could try to snap out the spirit visions that the exercise and exhaustion had dropped them into. Overhead, the disembodied voice of Donald Sutherland began to tell the story of Jebediah Springfield, or something. Some people started wandering around the floor, (yawn). A giant bear as might be seen in a department store window, only bigger, rises upward. People wander around some more, (yawn). Canadians begin to Twitter their apologies to friends in other countries. Global warming breaks up the ice floes projected on the floor. Whales appear to swim across the floor and spout, which was cool for the couple of seconds it lasted. Totems sprout upward to the ceiling and turn into trees. Sarah McLachlan lip-syncs, but no one-eyed cats or dogs appear. More people mill about the floor, appearing to be dancing or perhaps acting out some cruising action in Stanley Park. There was some sort of presentation of "Fiddler on the Canoe" (maybe a French-Canadian Jewish thing?) Then more fiddling and river dancing. A lot of giant maple leaves were strewn about, which you know, makes anything "Canadian". Finally the fiddling ended, and there were some video effects projected on the ground. Donald Sutherland told the tale of the silver tongue, or something. Joni Mitchell's "Both Sides Now" was played with an aerialist (Thomas Saulgrain) hanging overhead doing a tribute to Canada's flyover country. I like the song, but with a kid erratically bouncing around from a wire during it, not so much. But the video stuff was definitely good, probably the best part of the evening. From above, the giant iceberg mother ship landed and mountains were formed and people flailed around on wires again. NBC's Bob Costas generously and quixotically said, (after Beijing) "you do something that succeeds and touches people on its own terms. I think they've succeeded here." Keep those viewers watching until the last commercials have aired. Slam poet Shane Koyczan started babbling about Canadian identity, which the audience got off on, but as usual with such blabber, it just makes other people wonder how a nation could have such low-esteem that they need to keep telling themselves, "I’m good enough, I’m smart enough, and dog-gone it, people like me." The entertainment gave way to the ceremony part of the ceremony. The head of the IOC and the organizing committee spoke. The audience had all been given little drums and they used them in lieu of applause. The sound of thousands of Canadians beating off in unison was unsettling. Back to the show and kd lang or someone impersonating Wayne Newton at his heaviest starting singing. That was followed by the raising of the Olympic flag and the singing of the Olympic Hymn. Factoid: the Hymn was sung by opera singer Measha Brueggergosman, sporting the largest chia-afro ever grown on Earth. All that was left was to light the cauldron. The first athlete to appear with a torch was Paralympian Rick Hansen in a manual wheelchair, wheeling himself into the stadium. It looked like it was going to take awhile to get the cauldron lit. He passed the flame off shortly, and the final moments began before the cauldron catastrophe. Four athletes all got a lit torch and then assumed their positions at four corners on the floor. It was really too painful to watch, but one of the doors on the floor that hid the four legs to the cauldron failed to open and the flame bearers stood for several agonizing minutes as the directors decided what to do. Finally they went with just three legs and the cauldron was lit. The realization that "Vancouver, we have a problem," was horrible to watch on live TV. After the indoor cauldron was lit, Wayne Gretzky ran outside with a torch and got on the back of a Chevy truck and rode through the rain to the real cauldron. Sad, just sad, to see a drenched "Great One" put through that. Despite the problems, it was a reasonable show, and for anyone who enjoys picking things apart and being very catty, it was quite entertaining.